Three students from TSVS participated in the World Robotics Olympiad India 2018 (WRO India) that was held at Ahmedabad on 15th and 16th September 2018. 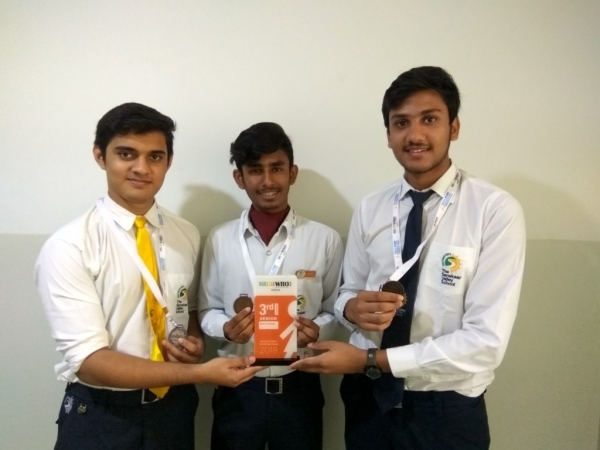 Shranay Agrawal, Ushneesh Saha and Snehil Banawal from Grade XII represent the school at WRO India which is one of the largest Robotics competitions in India for students in the age group of 9 to 25 years. This competition has been taking place since 2006 and aims brings together young people from all over the world to help develop their creativity and problem-solving skills through challenging and educational robotics competitions. The participants from TSVS secured 3rd position in the Senior category of the Olympiad’s National Level event. The mission of the Olympiad this year was to build a robot that supports the way we grow, share and consume food. This mission has been built around the Goal 2 of sustainable development goals.